Citroen will be introducing the Citroen C3 Pluriel Charleston special edition at this year's Paris Motor Show, paying homage to a design theme that once graced the lovable 2CV. The two-tone black and Bordeaux red color scheme is the big draw here — and by "here" we mean only in France where they remember the older model. 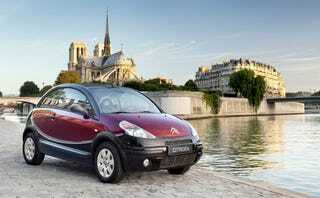 Instead of a special edition of the C3, we sort of wish they'd be debuting a new 2CV concept. C'est la vie. Press release and photos of a 2CV we spotted in Geneva below. Something To Dance About: The Citroen C3 Pluriel Charleston Citroën has released first details of a special edition of its funky convertible supermini, the C3 Pluriel - The Charleston. The limited edition model will be unveiled at next month’s Paris Motor Show and is expected to go on sale in the UK in early 2009. The C3 Pluriel Charleston fashions a contemporary reinterpretation of a design theme that once decorated Citroën’s famous 2CV - a stylistic nod to one of the most iconic cars in history, which this year celebrates its 60th birthday. With a blend of nostalgic and contemporary styling the C3 Pluriel Charleston should strike a chord with both 2CV fans and buyers looking for a vehicle with individual design flair. With its bold two-tone colour scheme of black and Bordeaux red, the sophisticated Charleston special edition will be positioned at the high-end of the Pluriel range with premium touches throughout such as gloss-black fittings, leather upholstery and chrome trim. Also fitted as standard are stylish 15” aluminium wheels which feature red embellisher centres that add elegance and definition.